moved from my rarely used website because I've decided I hate geocity. 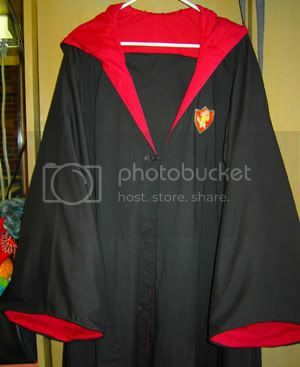 I recently completed making my Gryffindor PoA robes and decided that I would like to share the experience with others. This isn't a tutorial par-say, more of a log of how things went. 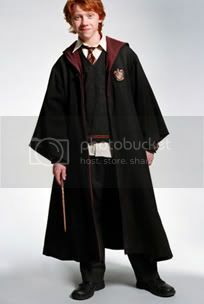 However, I'm hoping it will help others in the quest to make Hogwarts robes. 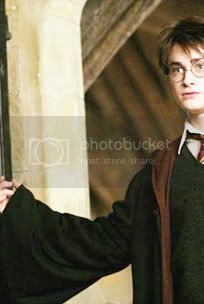 Right, so to start things off, I began researching photos of the robes so I could get a better idea of the three most important factors of this garment. 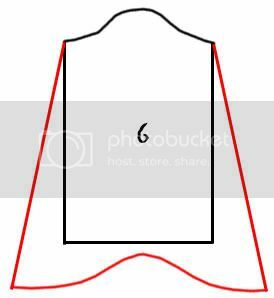 That's lenght, hood shape, and sleeve shape. 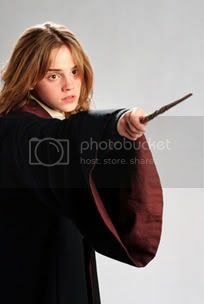 There are a lot of sites out there that have images from the Potter movies, and here are a few images that I think are helpful. 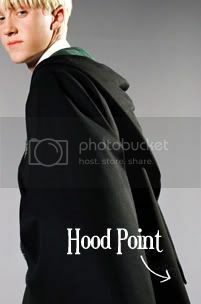 With the first picture of Draco Malfoy, you can see how far down the back the hood extends. I would say it goes down to about a person's tail bone. Also, in the second picture, you can see the shape of the point. 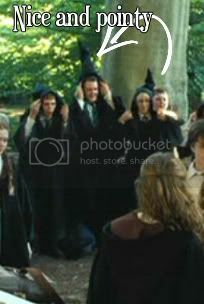 From the picture of Hermione, we can see that the opening is REALLY big. They appear to end at about mid calf length. 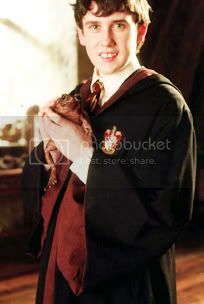 Ok, let's get to the heart of the matter, actually making your robes. Here's a rundown of what you'll need. Here's how I modified the pattern. Now, to start with, the pattern wants you to mess with this weird yoke thing. First mod. Cut out the yoke (piece no. 2). Using a marker, trace it on a piece of newspaper. Now cut that out, and fold it in half. Cut along that line (where the shoulder seam should run). Now, trace both of these pieces again, but this time, give the new seam you cut a 5/8" seam allowance. 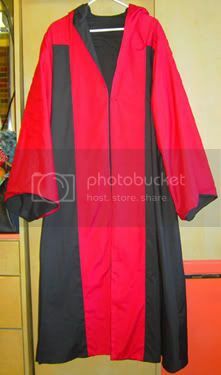 Next, you need to shorten the robe. Make sure you're wearing a shirt that has a seam that runs from your neck to your shoulder. Using a tape measure, measure from that seam down to your mid calf. Now lay out pattern peice No. 1, and set your new pattern peice 2a next to it, lining up the seams. 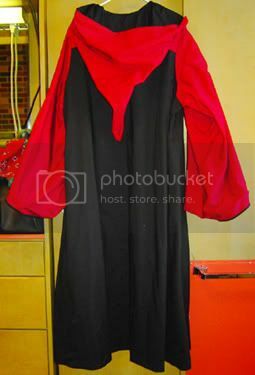 Measure from this shoulder seam to the bottom of the robe. Now suptract the number you used to measure yourself from the length of the robe. Say the robe's 60" and you wanted to cut it at 52", then you'd be removing 8". Measure from the bottom of piece 1 and cut off that length. Make sure you measure up every couple inches or so along the bottom seam so that you keep the curve in the bottom of the pattern. You don't want it to be a straight shot right across the bottom. Now, We'll be creating a new pattern peice for the robe. 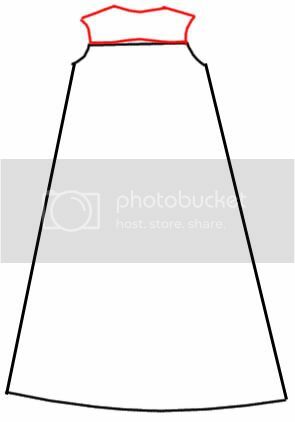 We're going to be putting 2a and 2b with peice 1 so that we can create the outside front and back of the robe that won't have a weird seam across the front. When we add 2a to peice 1, it will create 1a (the front of the robe). When we add 2b to 1, we'll create 1b (for the back of the robe). Here's a layout so you get the idea. Now, as you've perhaps noticed, there's a colored insert that runs along the length of the front of the lining. 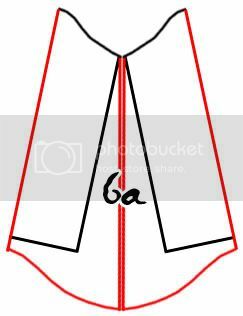 Since we'll be using the unmodified pattern peice 2 in the lining we'll be making an alteration to the pattern piece 1. Go ahead and trace it on some newspaper. Now measure in six inches from the front seam. Draw a line and cut along it. 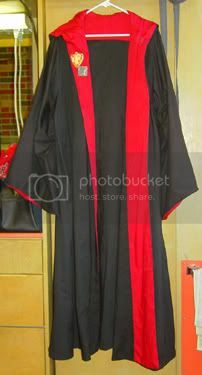 That creates pieces i1a (for the black lining of the robe) and piece i1b (for the colored insert). Here's a drawing. Make sure you add on an additional 5/8" seam allowance along the cut line so that when you sew the lining, it's not smaller than the outside. We're going to want to mess a little bit with the sleeve shape now. We want the opening to be a little wider and give it a curve. Begin by cutting out pattern peice no. 6, then trace it onto a piece of newspaper. Now draw on your alterations. It'll look a little something like this. Make sure that the right hand side is an exact copy of your left hand side so that it's symetrical right down the middle. You want all your seams to line up perfectly. Cut the pattern out. This is your new pattern peice 6. An optional step you can choose at this time is to create a new pattern piece for your sleeve lining. If you're like me, and you didn't want the seam to show on the inside opening of your sleeve, trace your new pattern piece 6 again, fold it in half and cut on that line. now tape it back together so it'll look something like this. Now on the lining, the seam will run along the top of the sleeve where no one will see it. This will now be pattern piece 6a. Last mod, and that's to the hood. I just extended the length of it for as long as I wanted it to be, then adjusted the curve to fit. Here's altered peice no. 4. Alright, so now you know what your modified pattern peices should look like. Time to cut everything out. A few words about cutting out this pattern. First of all, read through the pattern directions so you'll get a good idea of how to lay everything out. However, if you think you can fit things closer together to use less fabric, go for it. I certainly was able to do it. Second, if you're going to prewash your fabric (which I suggest you do), make sure everything is ironed flat so you can lay everything down smoothly. In my opinion, cutting everything out was the most frustrating part of making this pattern, because you're going to be working with a LOT of fabric. Make sure you have a large area where you can lay everything out and cut it. I was lucky that I was home for Easter when I cut my robes out because that meant the dining room table would be clear and I'd have a nice surface to work on. Ok, now it's time to put everything together. For the outside of the robe, I constructed it pretty much exactly as the pattern suggested. The lining was a little different because the sleeve seam ran along the top of the sleeve instead of the bottom. That meant I couldn't sew it while I sewed up the side of the robe. Instead, I sewed the seam on 6a, sewed up the side seams of the main body of the lining, then set in the sleeves. Initally when I wanted to make my robes, I didn't want any machine edged seams. 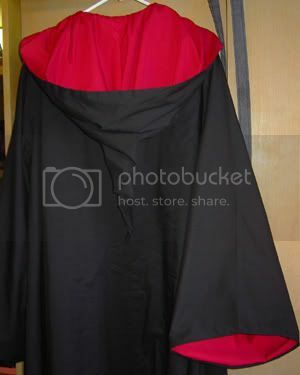 I thought I could have right sides face each other, then sew the bottom heam, the sides and hood, and the sleeve hems, then flip everything inside out by leaving the seam between the lining back and yoke open. Unfortunately, as I found out, that doesn't really work. The problem with this plan of attack, is that the sleeve hems throw everything off. What I ended up doing, was have right sides face each other, sew the bottom heam, and sew up along the sides and hood (make sure you stitch in the peice of hat elastic that you're going to be using for your closure when You're going up the front stretch). Then turn them right side out (through that yoke to back opening I was talking about). 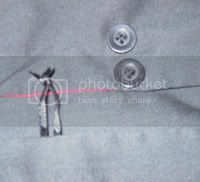 Close up the sleeve hems using a machine heming method. Also, take this oppertunity to sew metal washers into the seam of the bottom heam if you want to have that added weight. Also, if you don't want the stitching to go through both layers, you should also stitch on the buttons you use for your closure at this time, and sew on your patch. Now hand sew the stretch between the back lining and yoke that you used to flip everything out. Iron down your seams, and vola, you're done!